Now that Camp Horizon 2010 is completed and everyone is getting back into their daily routine, wouldn’t it be great to visit with your friends from camp. GUESS WHAT? The beach party is an excellent opportunity for everyone to get together. This year’s party will be held on Sunday, August 8 at Montrose Beach in Chicago. We request everyone bring a dish or snack to share. Horizon will provide napkins, paper plates and utensils. We could use your help! We are needing people to arrive early and help preserve a nice shady area. If you plan on coming and would like to help, please contact Anna at anna.lopez@associationofhorizon.org. The event is tentatively scheduled to begin around 11 a.m. but people will come and go all day. Pack up your sunscreen, swimming suits, and camp photos along with your refreshments and get ready for a GREAT DAY! 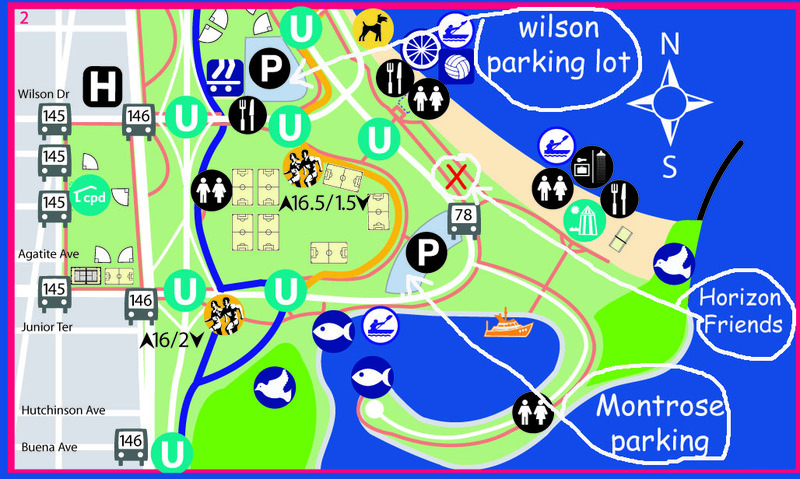 Our group will be located in the grass north of the beach house — under the shade of some trees and close to the beach. If you plan on coming, please leave a comment so we know to be expecting you.